Shown above is a carved and sandblasted HDU property name and address sign for a residence. 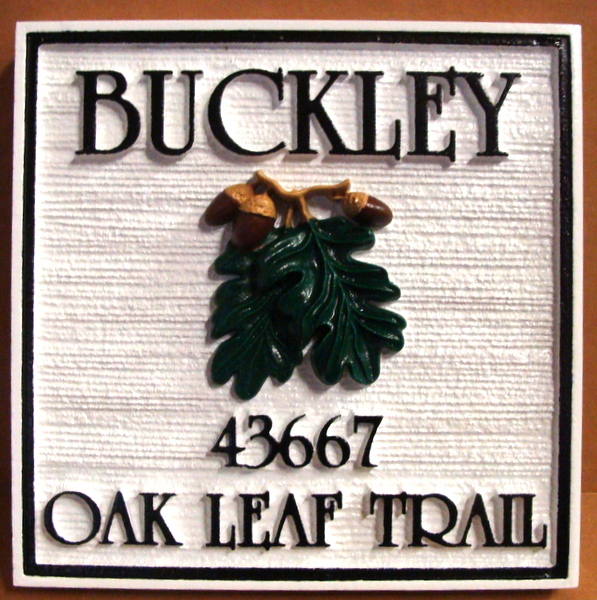 This sign has been carved with 3 levels of relief for the raised text and border, a 3-D carving of an oak leaf and acorn cluster, and a recessed, sandblasted wood grain texture background. The sign's background is then spray-painted and the text, border and art are hand-painted. Two layers of clear-coat are applied to protect the sign against scratches and UV fading. The sign can be mounted on a gate, wall, on a post or between two posts, or hung from a wood or iron hanger from the eye-hooks on the top.